Since I’m in Berkeley for a couple of weeks, it makes sense to visit some nearby wine meccas – Sonoma tomorrow, Napa Valley next week. Today, it was San Francisco’s Ferry Building (LINK), an admittedly touristy, but very good for foodies edifice at the foot of Market Street. For east coasters, think Faneuil Hall in Boston, South Street Station in New York, or Harborplace in Baltimore – but with much, much better food. My go-to lunch spot here is always the Hogs Island Oyster Company (LINK) on the water side of the complex. The space has been expanded a bit since my last visit, and now features three bar areas and some indoor and outdoor tables. 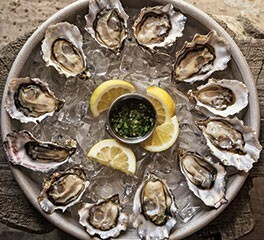 Oysters are the featured item, but the menu has much more from the sea. 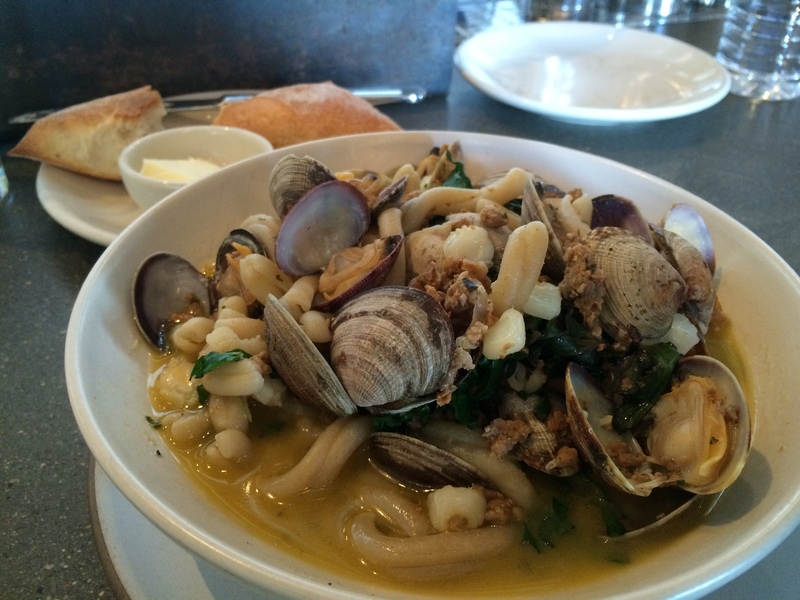 Today, I had steamed clams in melange of Mexican Chorizo, greens, hominy and jalapeno butter. 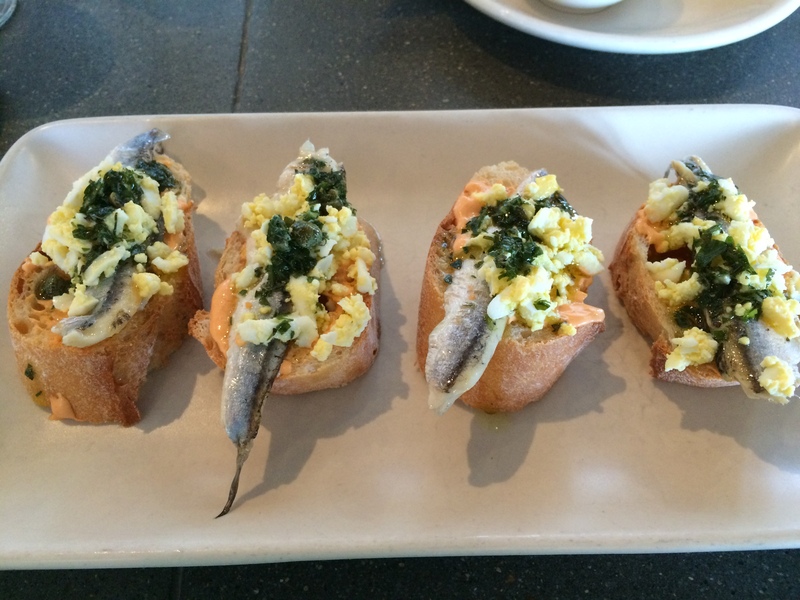 I started with Boquerones, sardines with piquillo aioli, chopped egg, green herb sauce on a sliced ACME Bread Co. baguette. Delicious and beautiful. 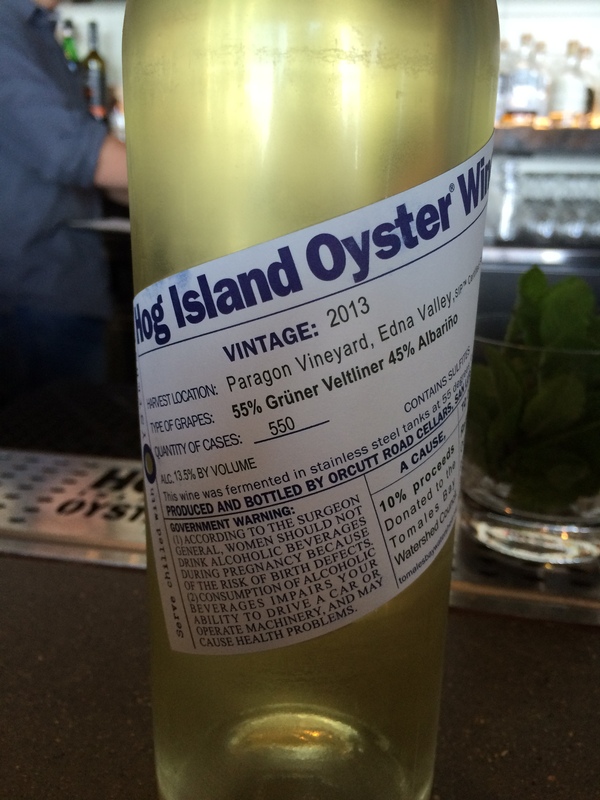 To wash this delicious feast down I opted for the house white wine, Hog Island Oyster Wine, a very interesting blend of 55% Gruner Veltliner and 45% Albarino from the California Central Coast’s Edna Valley. This unusual blend went perfectly with the seafood, existing somewhere between a Chardonnay and a Sauvignon Blanc in consistency. Fruity, but with a hint of flinty minerality, and a very different blend than you might get from the European versions of these varietals. I have had some Edna Valley Gruner Veltliner and Albarino, and this is an inspired blending of these grapes. 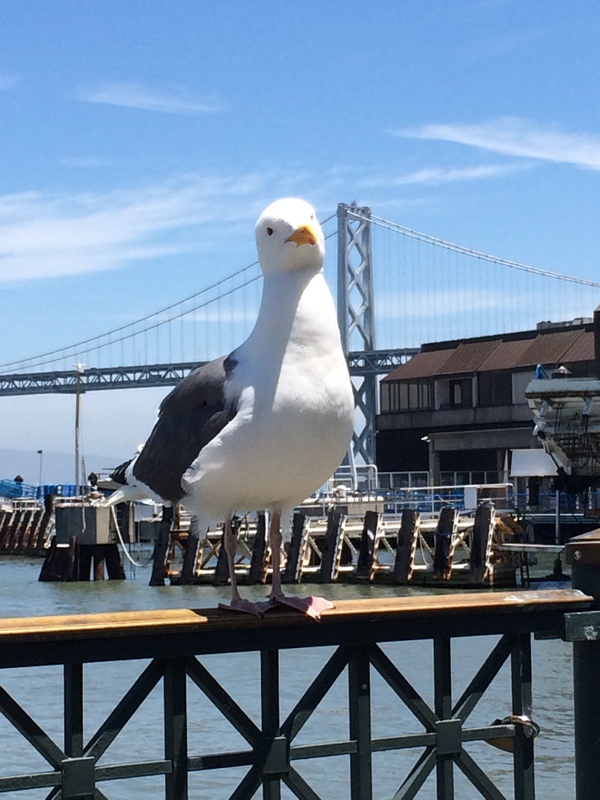 Afterwards, I wandered the halls of The Ferry Building, picking up some bread and chocolate to take home, and getting a Blue Bottle Coffee to sit outside by the water to enjoy with my new friend.